“If you cannot or will not imagine the results of your actions, there’s no way you can act morally or responsibly,” she told The Guardian in an interview in 2005. One of these days, I'll reward myself by reading The Left Hand of Darkness (published in 1969). Le Guin received many awards in her lifetime, but she wrote about refusing a prize once, which speaks a lot about her principles. I refused a prize once . . . It was in the coldest, insanest days of the Cold War, when even the little planet Esseff was politically divided against itself. My novelette The Diary of the Rose was awarded the Nebula Award by the Science Fiction Writers of America. At about the same time, the same organization deprived the Polish novelist Stanislaw Lem of his honorary membership. There was a sizable contingent of Cold Warrior members who felt that a man who lived behind the iron curtain and was rude about American science fiction must be a Commie rat who had no business in the SFWA. They invoked a technicality to deprive him of his membership and insisted on applying it. Lem was a difficult, arrogant, sometimes insufferable man, but a courageous one and a first-rate author, writing with more independence of mind than would seem possible in Poland under the Soviet regime. I was very angry at the injustice of the crass and petty insult offered him by the SFWA. I dropped my membership and, feeling it would be shameless to accept an award for a story about political intolerance from a group that had just displayed political intolerance, took my entry out of the Nebula competition shortly before the winners were to be announced. The SFWA called me to plead with me not to withdraw it, since it had, in fact, won. I couldn’t do that. Receiving and refusing awards—and handing them to someone—mean so much more than what meets the eye. Julie Phillips's profile of Le Guin in The New Yorker October 2016 issue is wonderful. I often find myself wallowing in regret whenever famous writers die before I even had the chance to read them. Sayang, di ko man lang siya nakilala. This happened with John Updike and so on. I know, I know, it's never too late, but still . . . . I have copies of The Earthsea Trilogy and The Dispossessed at home. 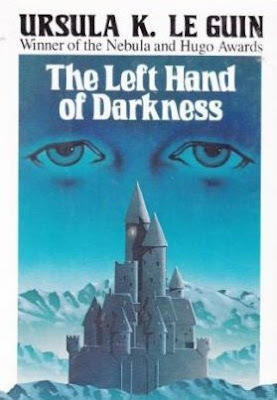 I think I have The Left Hand of Darkness as well. I was going to say, "surely you mean re-read!" but nope, you did mean "read" as in for the first time. You're in for a...not quite a treat since it's not what I would call a delightful book, but a good read nonetheless. Thanks for the warning! Not too "feel good" pala ito. Hahaha.